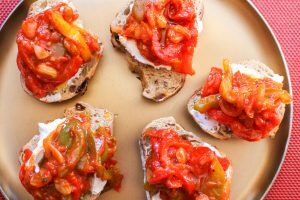 Peperonata is a sweet and sour cooked salsa made by cooking peppers with vinegar and sugar. I like to serve it on sliced baguette with some fresh goat’s cheese (it also works well with cream cheese). It’s the perfect “make ahead” canapé and it goes really well with chicken, turkey, ham or fish. Peel the onion, cut in half and then thinly slice. Add to a medium sized pan with a couple of tablespoons of olive oil. Thinly slice the three peppers then add to the pan with a pinch of salt and cook on a medium heat for about 10 minutes (until the vegetables soften). Add the chopped garlic, sultanas and tomato paste and cook for a further 3 minutes. Then add the vinegar, sugar, dried oregano and the fresh and tinned tomatoes. Stir well and simmer on a medium/low heat until the peperonata starts to thicken and become slightly sticky (this should take about 10 minutes, keep a close eye on the peperonata to make sure it doesn’t “catch” on the heat). Once most of the liquid has evaporated, add the parsley and some ground pepper. Take the peperonata off the heat, set aside and allow to cool before serving. Serve at room temperature.